British Prime Minister Theresa May attends a meeting at the National Cyber Security Centre on April 18, 2018, in London, England. Britain’s upper house of parliament inflicted an embarrassing defeat on Theresa May’s government on Wednesday, challenging her refusal to remain in a customs union with the European Union after Brexit. 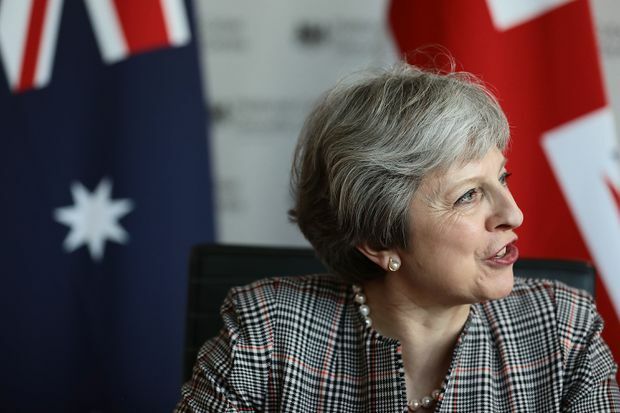 The Prime Minister, who has struggled to unite her Conservative party over Brexit, has said Britain will leave the EU’s single market and customs union after it quits the bloc next March so that London can forge its own free trade deals. “If in the end we do leave, it should be in way that limits the damage to the country’s wellbeing ... and that’s why I believe it makes sense for the government to be asked to explore customs unions,” said Lord (John) Kerr, a supporter of staying in the EU at the 2016 referendum. His comments were met by criticism from pro-Brexit peers, who agreed with Viscount (Matthew) Ridley who described it as “an attempt to wreck this bill and wreck Brexit” - a charge denied by those proposing the amendment. The government minister in the Lords, Lord (Martin) Callanan said ministers could not support the amendment because they did not believe that a customs union was in Britain’s best interest, suggesting it would seek to reverse the changes.